Carl’s Jr. is a fast food chain focused on the Western United States, with more than 1,300 locations in total. Its unique selling point is its thick, juicy burgers. They provide true burger afficiendos with a product that is considerably bigger than what they would find at McDonalds, and is also able to rival the biggest burgers on the Burger King menu. Carl’s Jr. is one of the oldest fast food chains in the United States. It is consistently ranked as one of the best franchises in the country and it is never too far away from the headlines or the spotlight. The Carl’s Jr. brand can be traced all the way back to 1941. It was created by married couple Carl and Margaret Karcher and first began life as a hotdog stand. The couple were forced to borrow money in order to buy the stand, which they placed in a busy corner of a Los Angeles street. The business proved to be very popular and within a few years they had four hotdog stands across the city. In 1945, they moved to Anaheim, California and set up a full-service restaurant. This was the first time they began selling burgers, doing so under the banner of Carl’s Drive-in Barbecue. In 1956, they opened two new restaurants. These were smaller than their main restaurants, so they named them Carl’s Jr.. And thus this iconic brand was born. Within a decade they had over 25 locations in Southern California and this passed 100 in 1975. It wasn’t until 1979 that Carl’s Jr. opened a location outside of California, at which time they had over 200 restaurants. However, they struggled to gain traction outside of The Golden State and for many years they relied on their CA locations to keep the business afloat. But in 1997 they were acquired by Hardees, who helped the brand to grow across the entire west coast. The man behind the brand, Carl Karcher, passed away in 2008 aged 90. His wife had passed two years earlier aged 91. Both of them lived to see their small hotdog business transform into a fast food giant worth billions of dollars. Carl’s Jr. are no strangers to controversy. In fact, they play on this as much as they can. Their advertising campaigns often feature semi-naked women. They are often tongue-in-cheek and they always look to inject humor into everything that they do. The CEO of Carl’s Jr. has actually gone on the record as saying, “If [the public doesn’t] complain, I go to the head of marketing and say, ‘What’s wrong with our ads?’” These adds do get a lot of complaints. But they also help to increase sales and over the years they have grown the brand considerably. Carl’s Jr. is limited to the Western and Southwestern United States. But this is a name that is recognised from coast to coast and from border to border. This is all thanks to their ad campaigns, which have featured countless models and stars, including socialite Paris Hilton. In 2016, they used NFL Running Back Todd Gurley–who played for the LA Rams at the time–in one of their campaigns. The ad, displayed above, was criticised and widely mocked for its use of CGI. This is a common trick in marketing and often goes unnoticed. However, in this case, it was hard to miss. But the press that Carl’s Jr. received for this campaign, with Twitter, Facebook and Youtube combining to give them tens of millions of views, you can’t help but wonder if it was all a very clever marketing gimmick. Carl’s Jr. are best known for their burgers, which are ranked as some of the best in the business. This is the place to be if you want a thick, juicy burger loaded with extras. Their burgers are charbroiled, which means they are grilled over burning charcoal. This is barbecued meat at its very best. There are Thickburgers, Bacon Burgers, Angus Burgers and Turkey Burgers. Their All-Natural Burgers have also proved to be very popular and have featured prominently on their marketing campaigns. These burgers come from cows that have been grass fed, cows that have never been fed hormones or steroids. As well as their famous burgers, Carl’s Jr. also sell a selection of chicken meals and salads; a variety of breakfast items, including biscuits; all kinds of fries and other carb-heavy sides; desserts like cookies, ice cream and cake; and an assortment of drinks. Carl’s Jr. have embraced the idea of the secret menu and the Carl’s Jr. secret menu is one of our favorites. It’s comparable to the Burger King secret menu, but it’s not all about big burgers and sloppy sauces. There are many special diet hacks on the Carl’s Jr. secret menu. So, whether you’re a vegetarian, a celiac or you just want to cut down on your carbs, this secret menu is ideal. In most cases, it’s just about knowing what to ask for, which we can help you with. And the best thing about this particular secret menu is that all Carl’s Jr. locations are focused around a small geographical location. As a result, these menu hacks don’t get lost in translation and are not limited by the region you’re in. 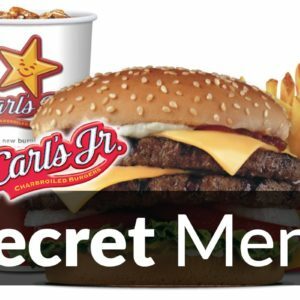 Once you checkout the Carl’s Jr. secret menu, you might want to try some other regional secret menus to see what we’re talking about. The Del Taco secret menu is another prime example of this, and we would also recommend the El Pollo Loco secret menu. Some hearty Bacon Cheddar Fries (three words that were born to go together) and a Double Stack Cheeseburger from Carl’s Jr.
Carl’s Jr. burgers are unashamedly fattening. As evidenced by their advertising campaign, they focus their attentions on young, hot-blood men. The majority of their customers are not very calorie conscious. In most cases, they don’t care how much sugar and how much fat is in their burger. They just want it to taste good, and with Carl’s Jr. burgers, there are no concerns there. The menu items that pack the biggest punch include their All-Natural Burger Double, which contains over 1,000 calories and 64 grams of fat; their 1/ lb Guacomole Bacon Thickburger, which contains 1,210 calories and 89 grams of fat; and their 1/2lb El Diablo Thickburger, which weighs in at 1,270 calories and 84 grams of fat. If you order one of these, add a hefty side like the Bacon Cheddar Fries (pictured) a drink to wash it all down with and a dessert to top it off, then you will be looking at close to 2,500 calories. If so, you probably want to make sure that you don’t eat anything else for the rest of the day. However, there are some lower calorie options out there. There are also some options for special diets, whether you need to cut back on fat, sugar, sodium or gluten. To view these options for yourself and to see what some of the biggest menu items contain, read our Carl’s Jr. Nutrition Guide. Carl’s Jr. is a traditional burger restaurant. But you won’t find any dollar-menu items here. These burgers are big, loaded with slabs of charbroiled meat, cheese, relish and served in a big bun. $1 might get you something to eat on the McDonalds menu and even the Sonic menu, but it’s not going to go very far here. That’s not to say that Carl’s Jr. isn’t cheap though. Because when you consider what you’re getting for your money, it’s very reasonable. Carl’s Jr. menu prices are standard across the board. They should be the same in Southern California as they are in Las Vegas. There are optional extras to add, meal combos to take advantage of and more. But generally, you can get a 1/2lb burger, a drink and a side for around $10. Carl’s Jr. locations are mainly in the Western United States. In California, you’re never too far away from one, and there are many locations in adjoining states as well. Carl’s Jr. focused their attentions on this part of the world for several decades before they looked to expand. But once they set their sights further afield, they grew very quickly. These days there are many Carl’s Jr. locations outside of the United States. However, they don’t quite have the reach of international chains like Subway or KFC. Carl’s Jr. can also be found in Australia, Japan, India and Colombia. Carl’s Jr. is open 7 days a week and typically begins serving customers at 6:00am for the breakfast rush. It remains open throughout the day and doesn’t close until 10:00pm. However, these hours are shortened on Sunday, when they open a little later and close a little earlier. Hours may also differ during holidays.